THE BEARD IS DONE! My brain started to hurt from thinking about how to proceed with the beard for so long. I really couldn’t find a solution that would work and look good at the same time. But I did in the end and I bring you proof! Prepare yourself, because this is a picture-heavy post. But before showing you the beard, here you have a picture of Anachromie with another layer of paint. It’s still not finished and it needs black washing, but that will have to wait til tomorrow. 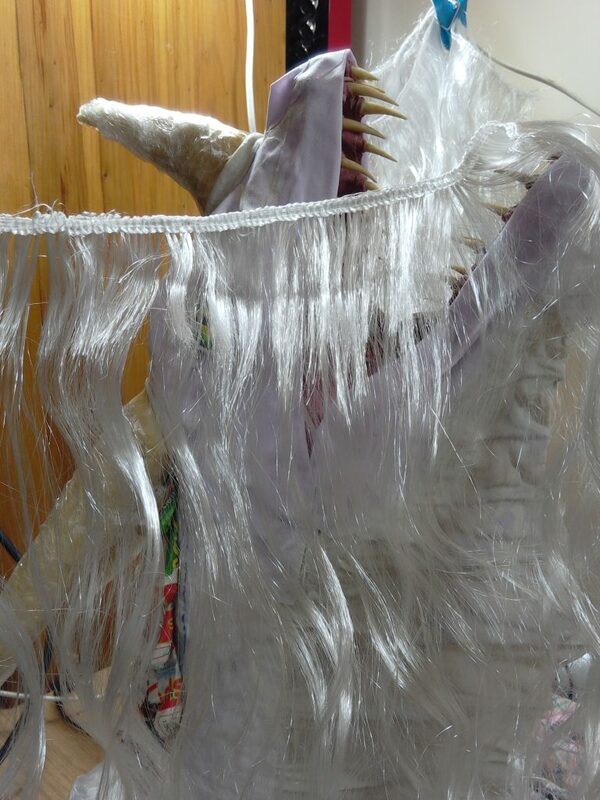 So, remember how I prepared the white wig? You can find it on this post if you missed it. What I did was cut off half of the seam line. 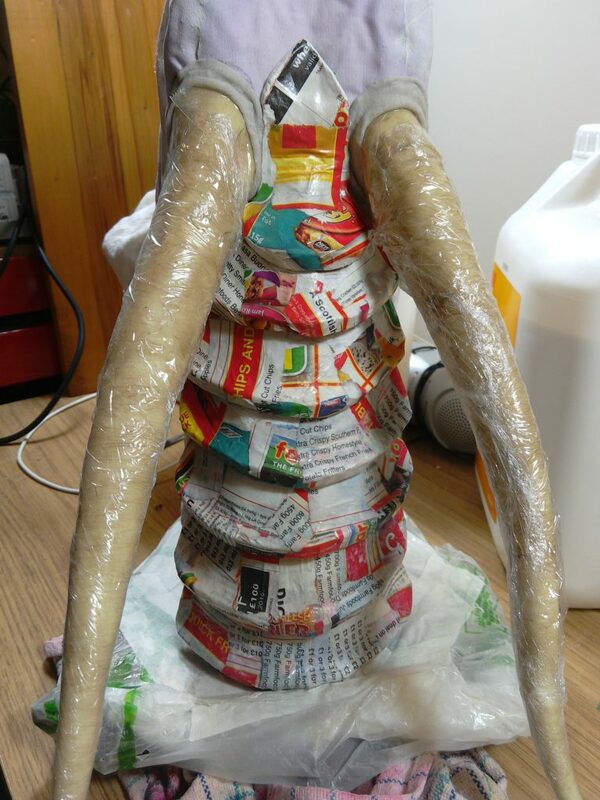 I could do this safely only because I literally bathed the whole seam on PVA glue, otherwise the hairs would just fall off. I did this so the beard would look as natural as possible, with a smooth and seamless transition between skin/scales and beard. Tough stuff though. 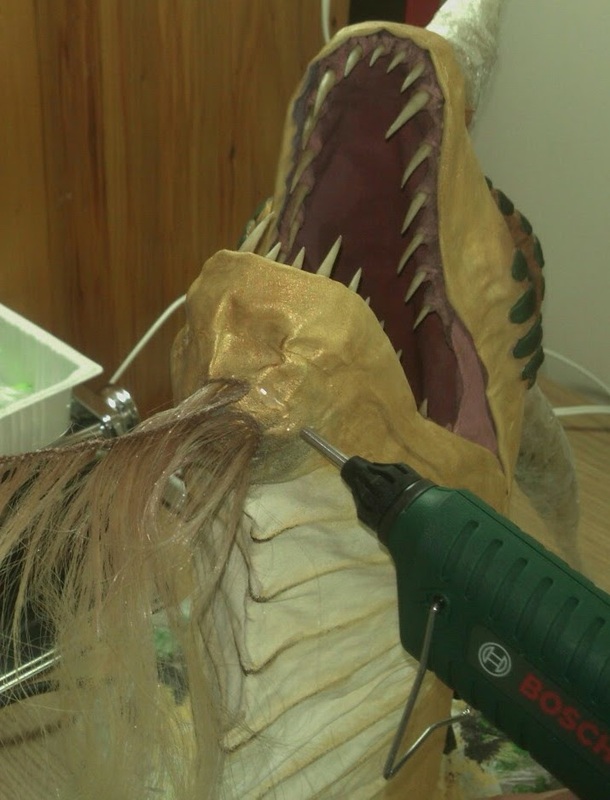 Once the hot glue gun was good to go, I calculated where the middle point of the beard would be, then I started gluing the hair strands to the chin in a spiral. I put extra glue in the crevices of the chin so it would be a bit smoother. 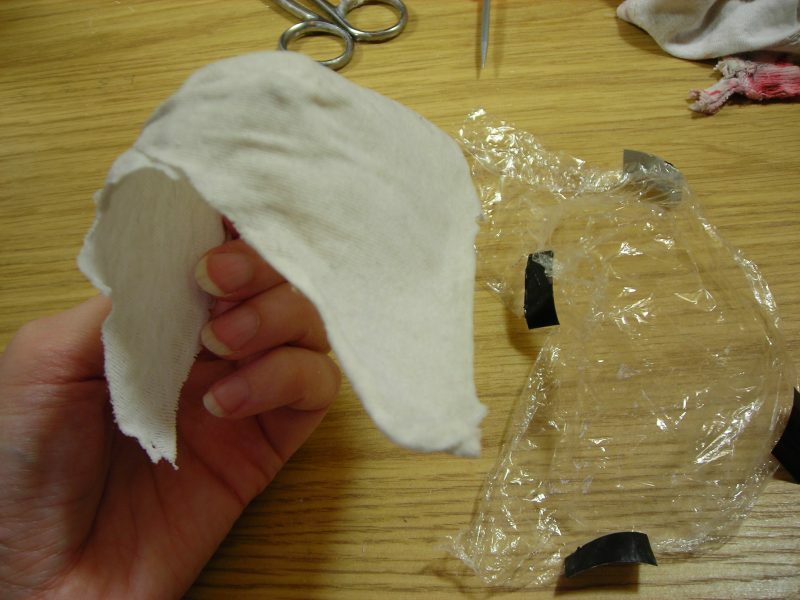 The trick is to dip your finger in cold water, and while the glue is still hot, press it down and shape it to your convenience. 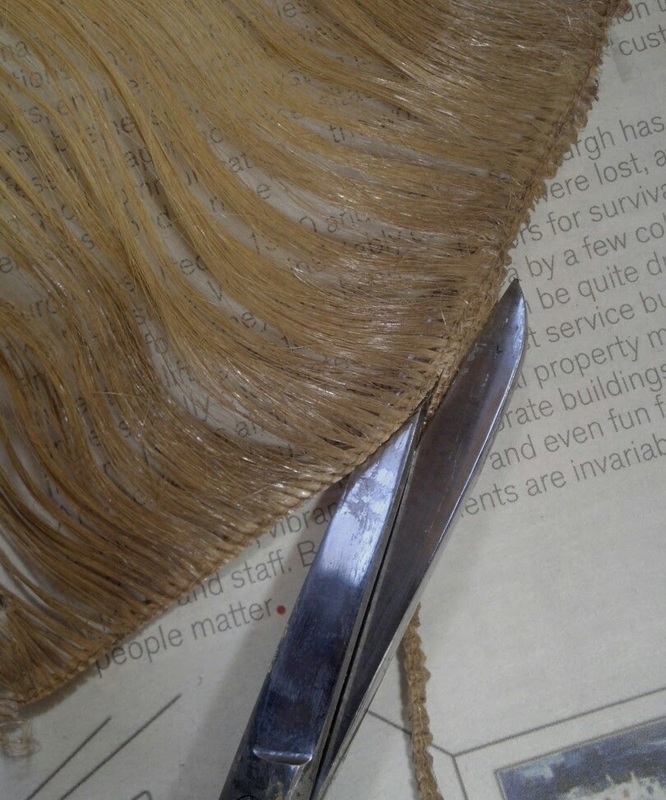 I kept on gluing hair in a spiral until I was done. I used a length of about 70cm in total (not the length of the hair itself, I mean the strips). As you can see above, the result was a very nice full beard. 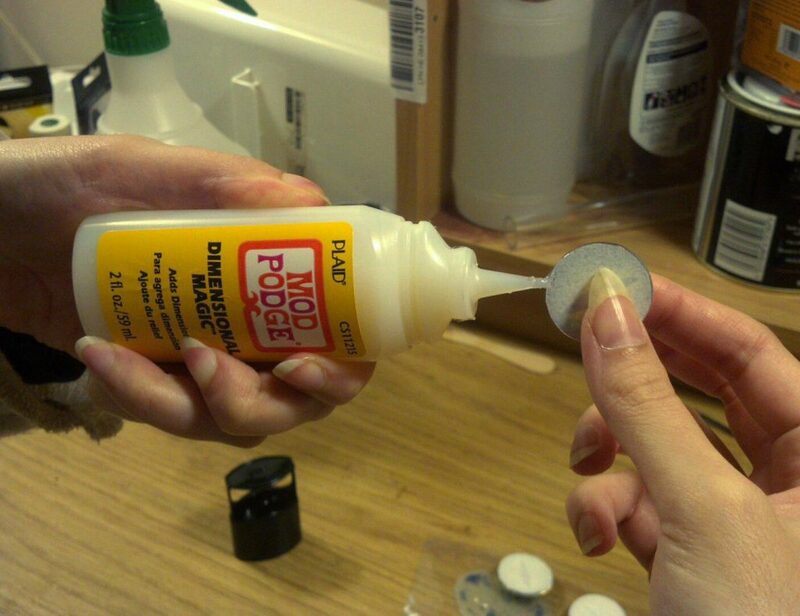 But now I had to deal with that unsightly hot glue. 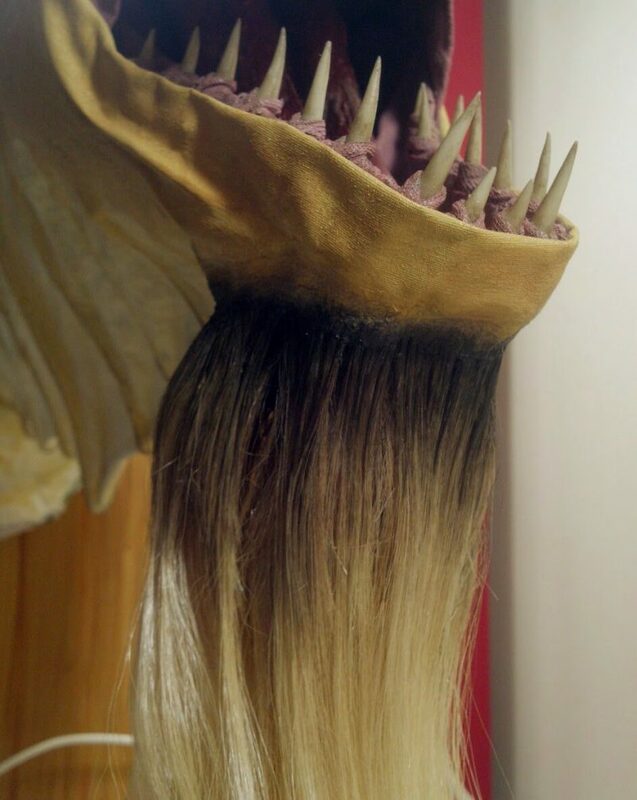 And of course, you can’t just paint it because acrylics don’t stick to it that well and it looks awful in any case. I needed something that would blend into both the skin/scales AND the beard. So I decided to experiment with something quite unconventional that I had never used on any piece of art: surgical tape! This stuff. 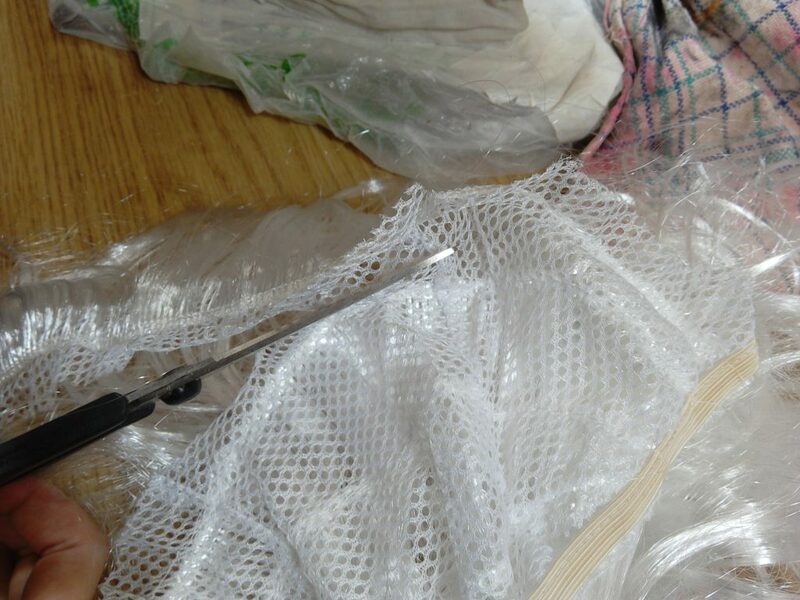 In case you’ve never heard of it, it’s basically a very thin paper-like tape that’s very flexible, porous and you just put on your skin when you want to avoid an infection on a wound. The thing with this tape is that the glue is extremely sticky and sort of waterproof (it doesn’t fall off your skin even after a shower). And since it’s so thin and paper-like, I thought it would be a good thing to use. 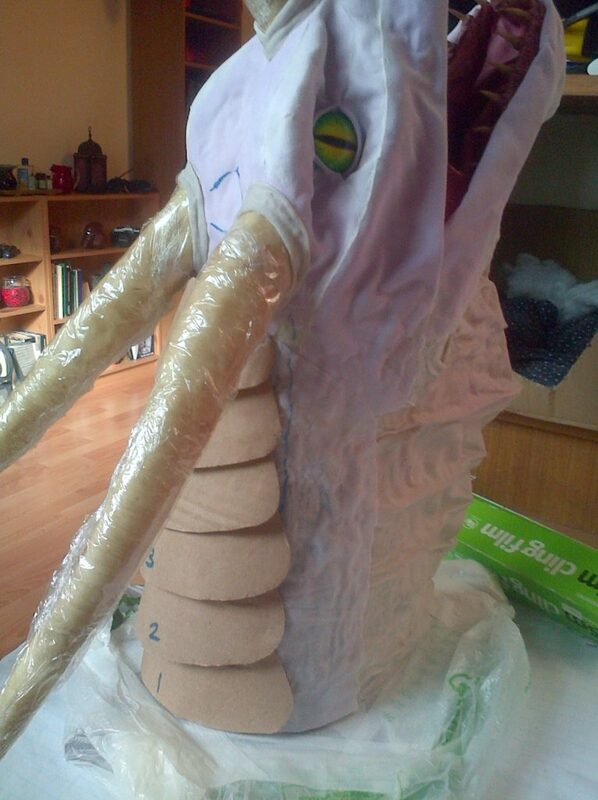 After covering the seams and all of the hot glue, I added a few layers of tissue paper. I made it really damp to the point that it broke apart, and smudged it into the strands of beard hair. It didn’t take too long to dry. I painted the whole thing ochre and then dry-brushed both skin and beard with raw umber until it looked natural. The transition doesn’t look as smooth as I would like (the tissue paper is a bit too wrinkly compared to the smoothness of the cotton fabric), but it’s acceptable. Now I just need to black wash it and it will be ready! I’d love to hear opinions on the beard. Find me on Facebook or Twitter and let me know, or just leave a comment of course. 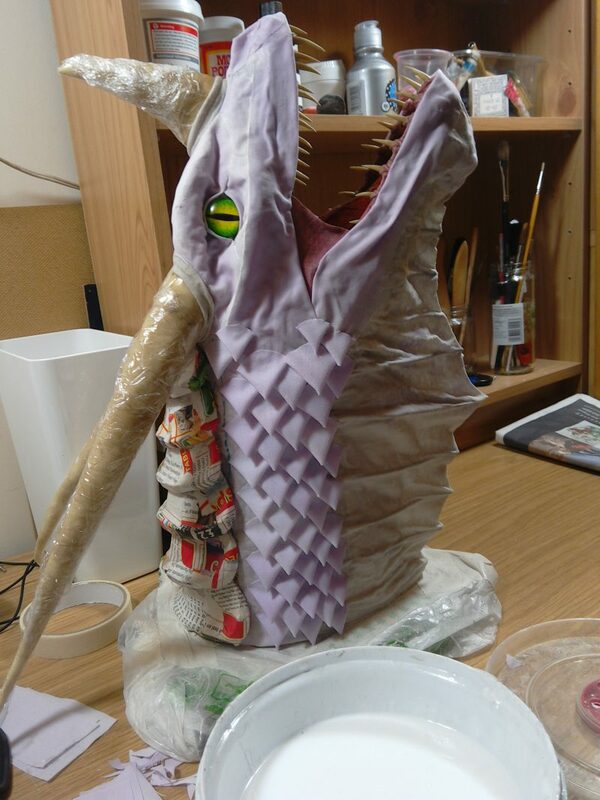 So, last night I was giving Anachromie her first coat of paint, when a not-so-unexpected problem happened. 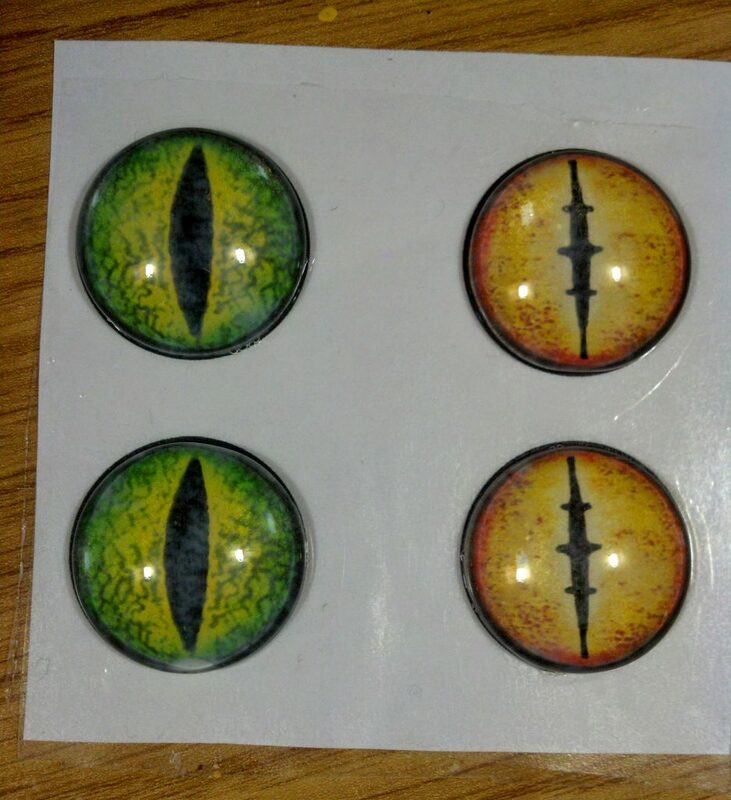 In case you don’t know or remember, the eyes for this dragon were drawn and painted by hand with markers (it’s all explained with pictures in this post). Even though they were proper markers, As soon as the water penetrated the fabric while painting with acrylics, the ink raaaan wild! Well, maybe not that wild, but it did run. 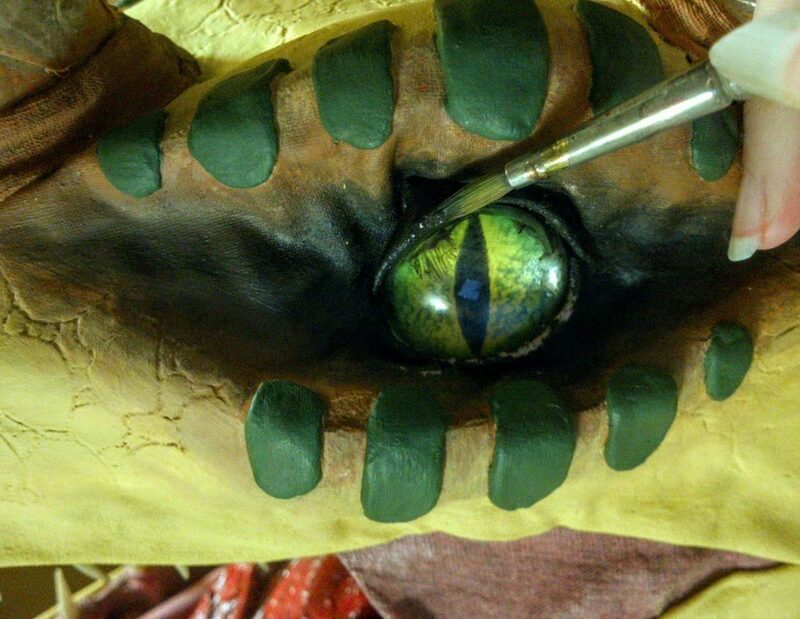 So basically, I had to perform eye surgery after the paint dried to remove the eyes and replace them. The new eyes look sooo much better than the old ones, I’m actually glad that they got messed up. Now, to prevent the same tragedy from striking again, I laminated the paper with plastic, glued it to the cabochons (glass domes) and sealed the sides used something that I very rarely use but that proved great for the task. I’m talking about Mod Podge’s Dimensional Magic. It’s a thick liquid that dries up to look like glass, pretty much like liquid clear resin. I think some clear nail polish could have done the job as well… maybe. I need to test that. But anyway! 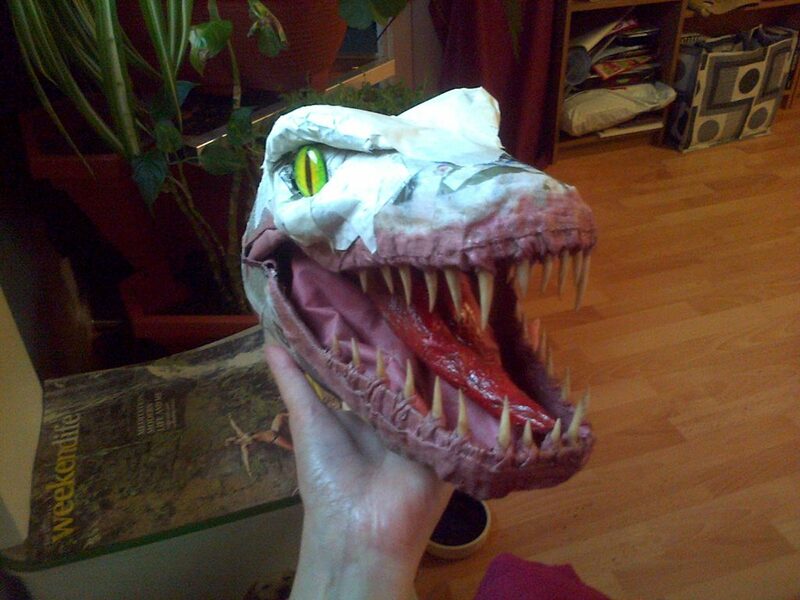 The eyes are now fixed and look fantastic! First of all, apologies for the lack of proper white balance on the pictures below. Yes, you will notice. Sooo, anyway, down below you’ll be able to see the dried “fake” chin (it’s very rigid now), and also the glue on the hair strips dried up. It feels very secure now and they’re not losing hairs anymore, so I went ahead and gave all of the strips a good combing. 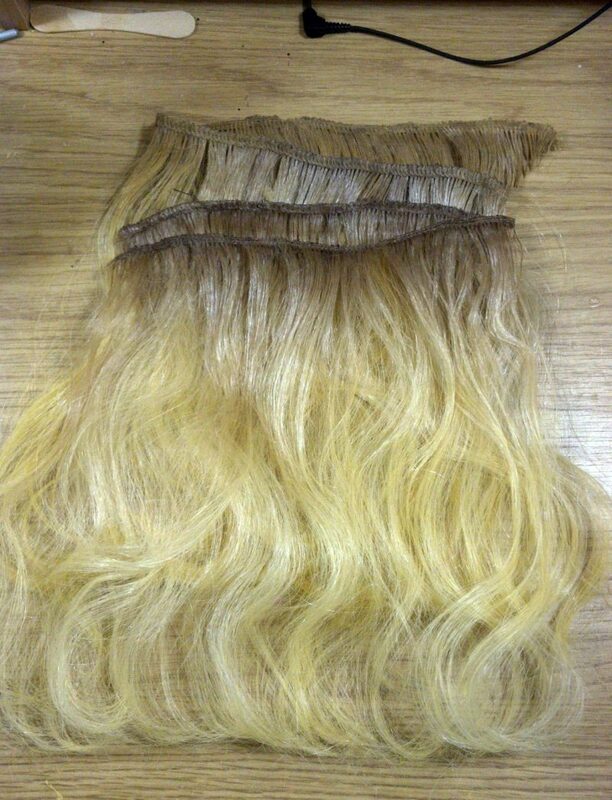 To dye the hair I just used very diluted acrylics and a hard brush. 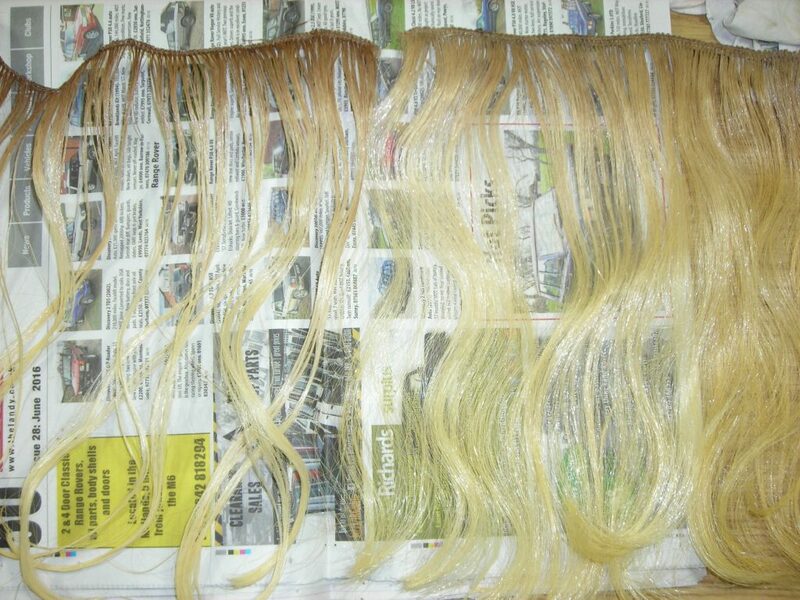 The trick is to dye them in the front and then the back. 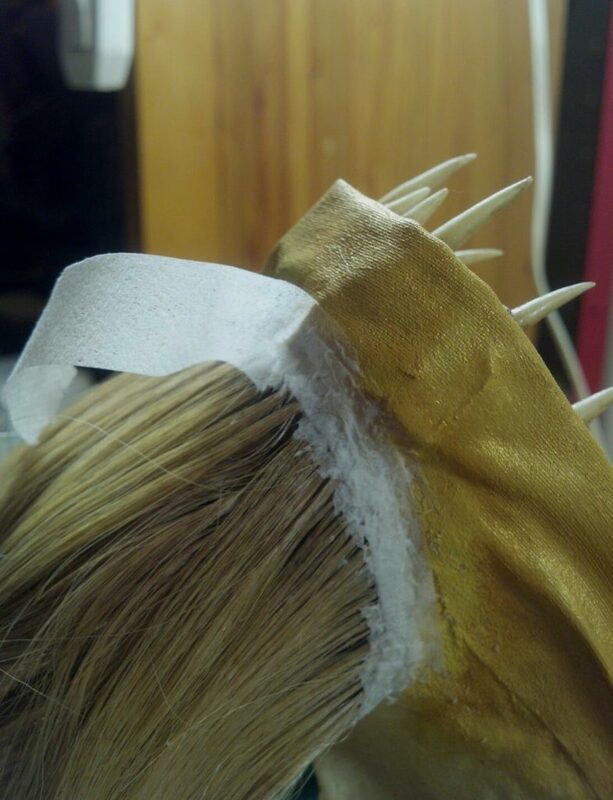 If you don’t dye both sides, chances are there will be bits of hair that will stay white here and there. It’s very important to dilute the paint quite a lot too, if it’s too concentrated, the hair will just stick together. If this happens to you, don’t worry, just give it a quick rinse with warm water under the tap and remove the excess paint. It should be alright when it dries! 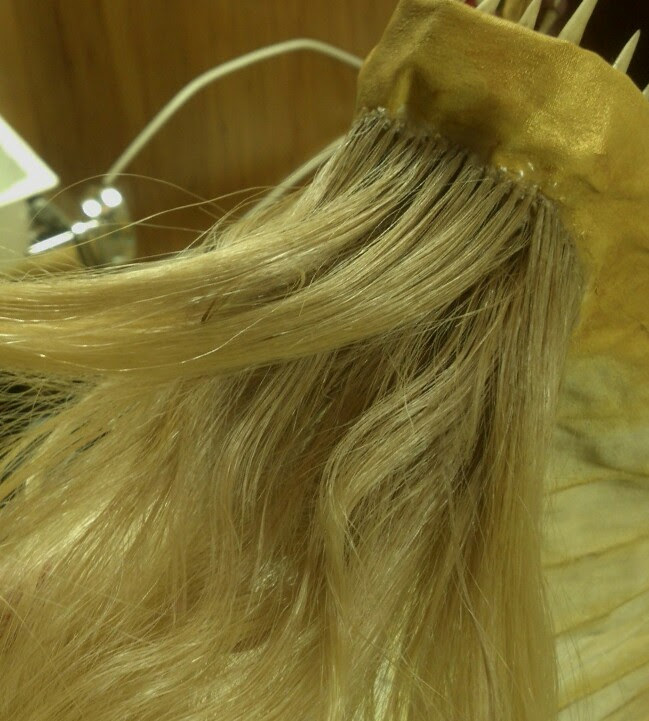 Above (on the left) you can see what the hair looked like when it dried. On the right is what it looked like after combing it. And finally, below you can see all of the hair I prepared dried and brushed. So silky and smooth! I made some locks a bit yellower than others. I’m glad it’s still noticeable after drying. I think it will make for a cool effect when put together in layers! I guess we will see. Hair. Perfectly common in humans, not so much in dragons. Anachromie is a gorgeous bearded lady though, so today I’m showing you how I prepared her beard. I had to ask a good (and informed) old friend of mine on how to do it, since my experience with hair in general is very limited, so thank you, o Queen of the Bright Lights. 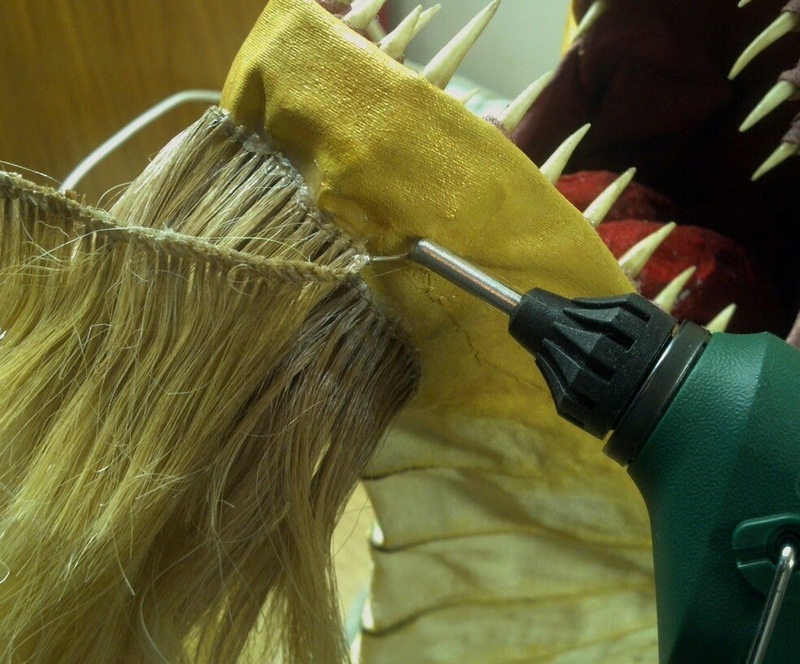 I was advised to make a “cap” to attach the hair to, and then glue the cap to the rest of the dragon. I’m not sure that’s how I will proceed, but I did it anyway. 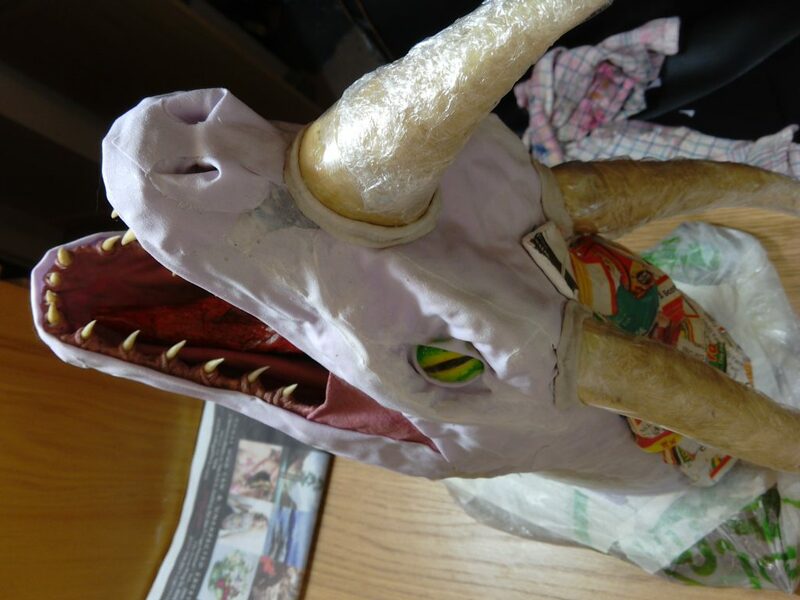 I took a piece of cloth, dipped it in PVA glue and shaped it to the dragon’s chin with a thin layer of transparent cling film in between. I let it dry in a position where it would hold the shape but not fall off. 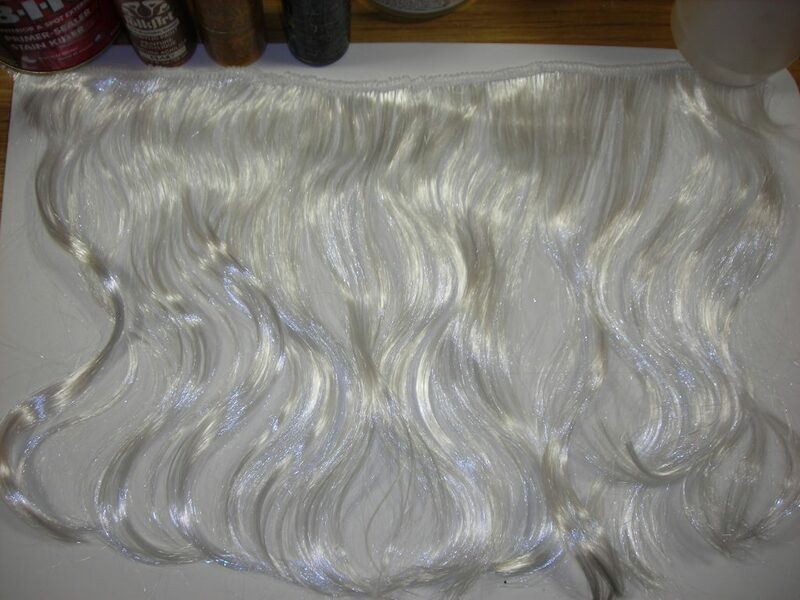 Now, regarding the hair itself, what I did was purchase a white wig (long and wavy) with the intention of dying it myself. 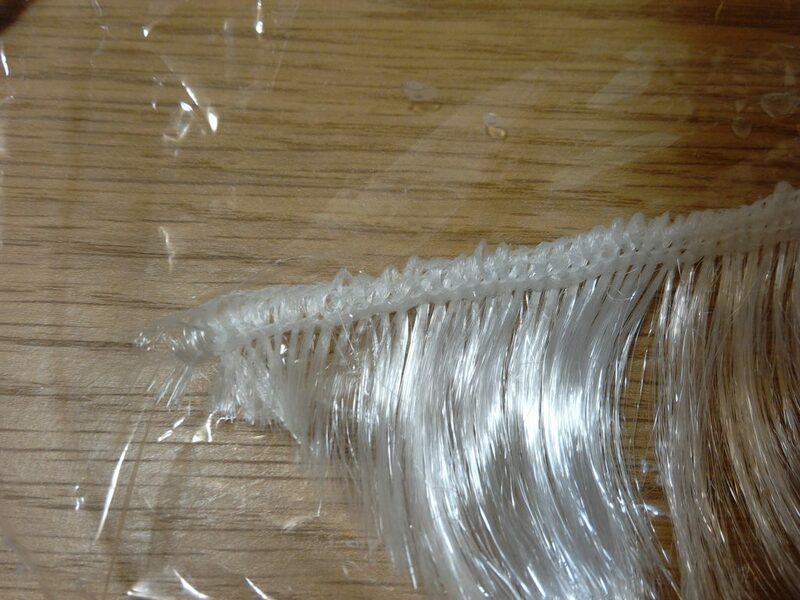 I turned it inside out, and cut the mesh following the lines of hair sewn into it. 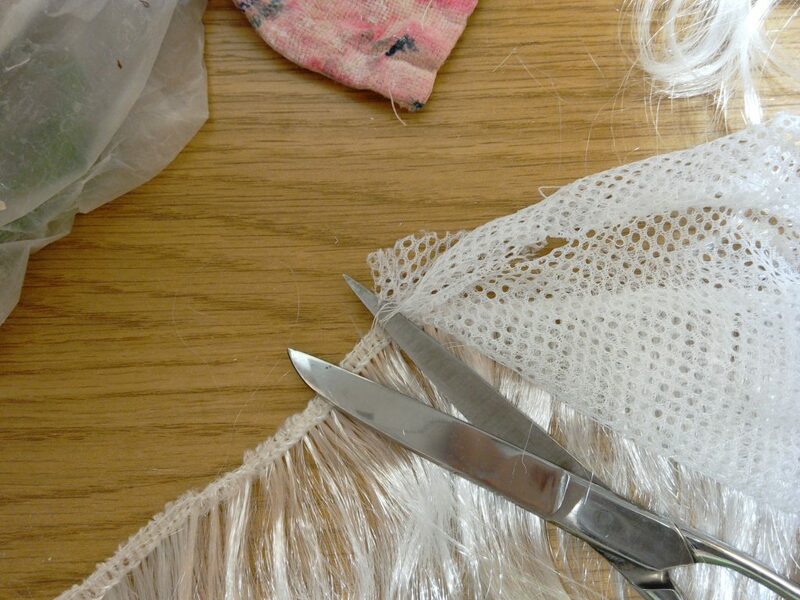 Then, I cut and pulled all of the mesh and thread until the stripes of hair became loose. 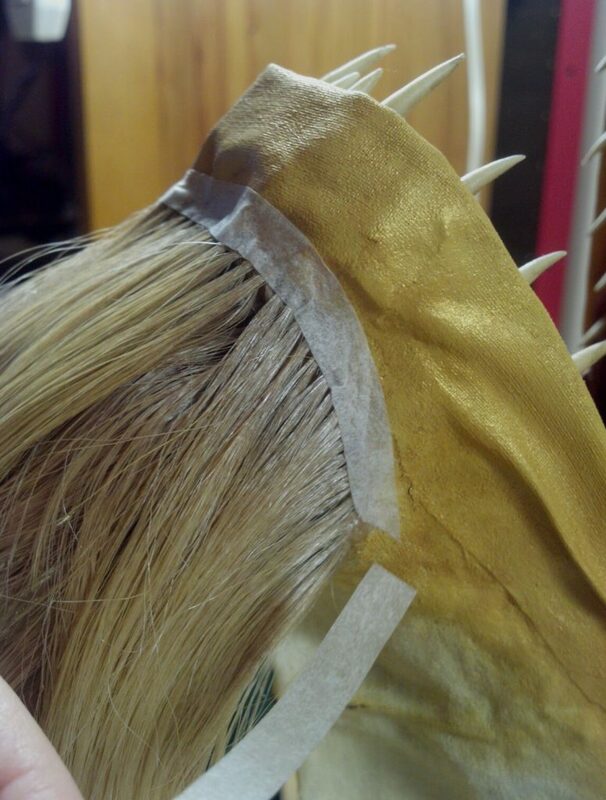 At this point, the stripes of hair were rapidly losing hairs after removing the stitches that kept them sort of restrained though, so following my friend’s advise, I strengthened them with PVA glue. 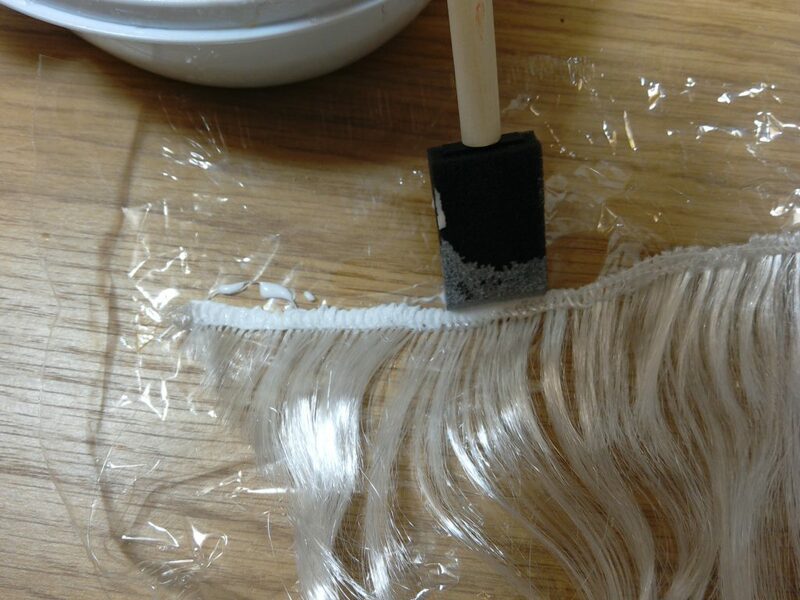 I used a sponge to literally soak the base of the hairs on top of an acetate sheet (so it wouldn’t stick). 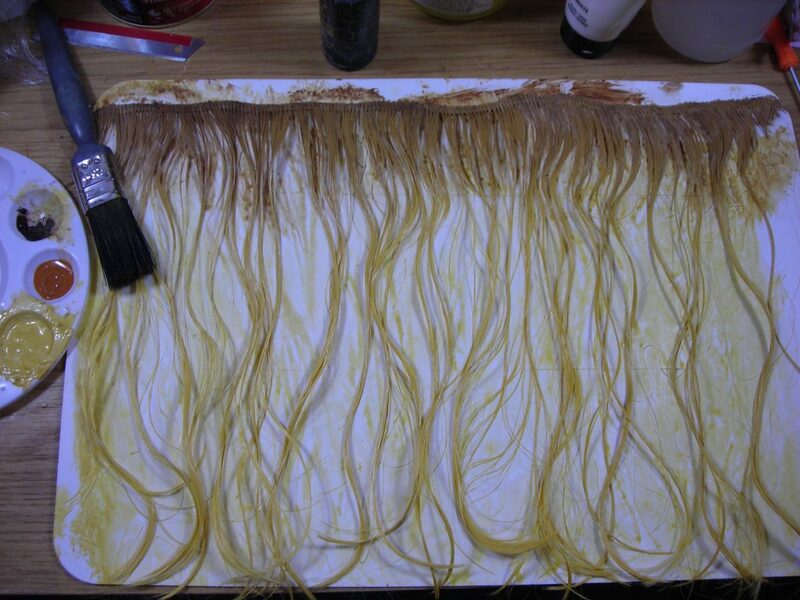 I did this to enough strips of hair to make the beard…. and a bit extra, just in case. Now to let it dry! Yay! 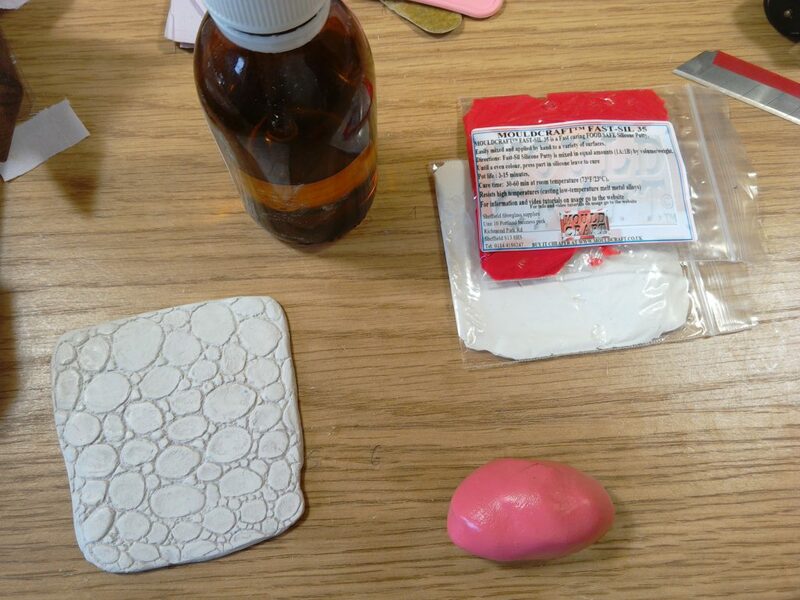 The time has come to test the silicon mould and the clay mix. First of all, I dampen the surface with water and glue. In my experience, doing this prevents the excessive drying of the clay on one side, and thus, chances of cracking will be very low. The layers cloth and newspaper absorb A LOT of moisture very quickly, it happens when painting with acrylics too. 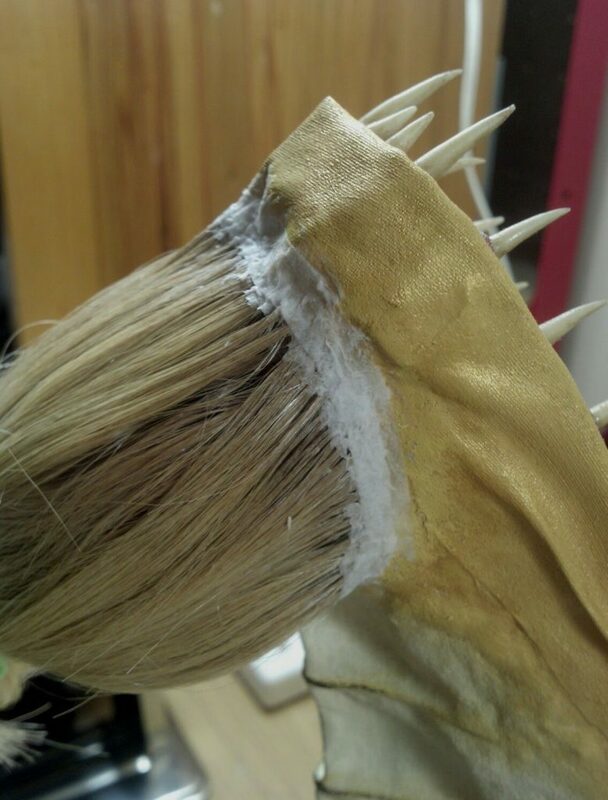 Also, I had to do it because I needed to smear the clay into the cloth around the borders so it blended well into the cloth area, instead of looking like a chunk of something smooth on top of something different, if you know what I mean. The excitement! Why am I excited? Because I’ve been waiting for two weeks to do this. As I showed you in the previous post, I found the perfect combination of air-dry clays that will allow for a shock-proof, non-shrinking, detail-grabbing surface. And so I bought some ridiculously overpriced (£6 for 50g of the stuff) two-part silicon to make a reptile-like scaly skin mould to use on it. 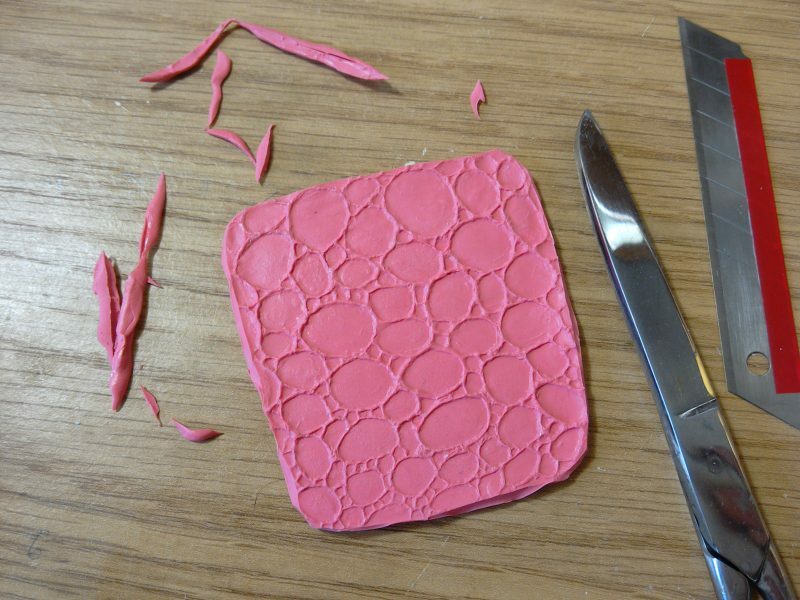 So I started by carving into a flat square of clay the pattern that I wanted to make a mould of and let it dry. Once cured, I sanded it with a high-grit sanding paper (very smooth), added some final touches and finally gave it a good rub with denatured alcohol. Once the alcohol was completely evaporated (very important, as it could stick to the silicon), I ointed the whole thing with a mix of Vaseline and mineral oil and proceeded to mix the silicon. It started to set VERY quickly, so I pressed it well against the piece and let it settle. It took less than five minutes to cure. I removed the silicon and cut the borders and bits that were stinking out… and voilà! I got the mould. Who can say when the postman will bring the supplies you ordered? Only time. Humans seem to know their planet really well. They’ve made a lot of advances on the logistics field, but even still it usually takes a long time to transport something across an ocean. I’m told the waiting times now are nothing compared to what they used to be. I guess I believe that, it makes sense. This world is so immensely vast, I can’t fathom the concept of travel when they talk about these kind of distances. It would be most educational to go somewhere really, really far away. Not on a plane though. Apparently being a plane is like being stuck in a sort of limbo, where you have no idea of where you are in comparison to Earth and you don’t know how fast you are traveling either. It really doesn’t sound very fun… but I’m set! I need to set off on a trip (by land) one day. My apologies for not posting anything in the last two weeks. I’ve been working on things, just not entirely related to Anachromie. Besides, I was waiting for some supplies. Now that I’ve got them though, I call tell you all about it! 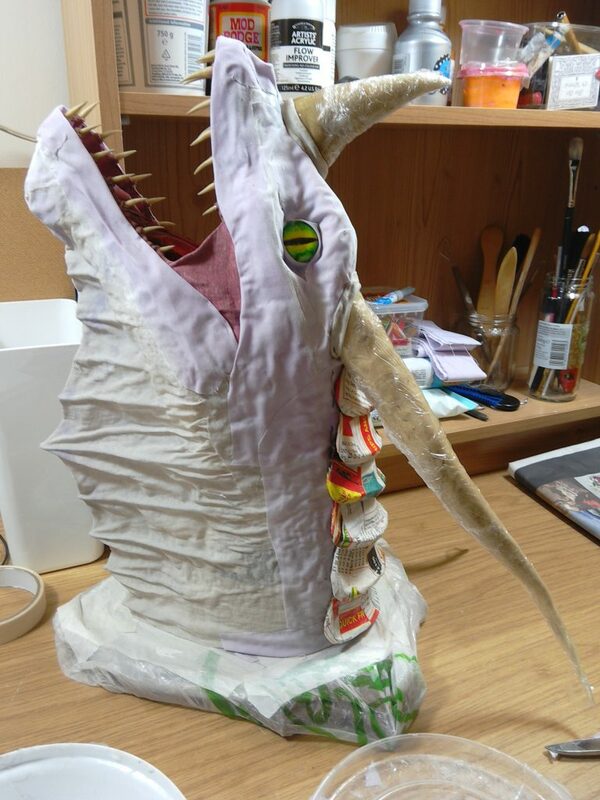 Basically, after finishing with the face as I showed you in my last post, I started a series of experiments to decide what would be the best thing to do on Anachromie’s neck. 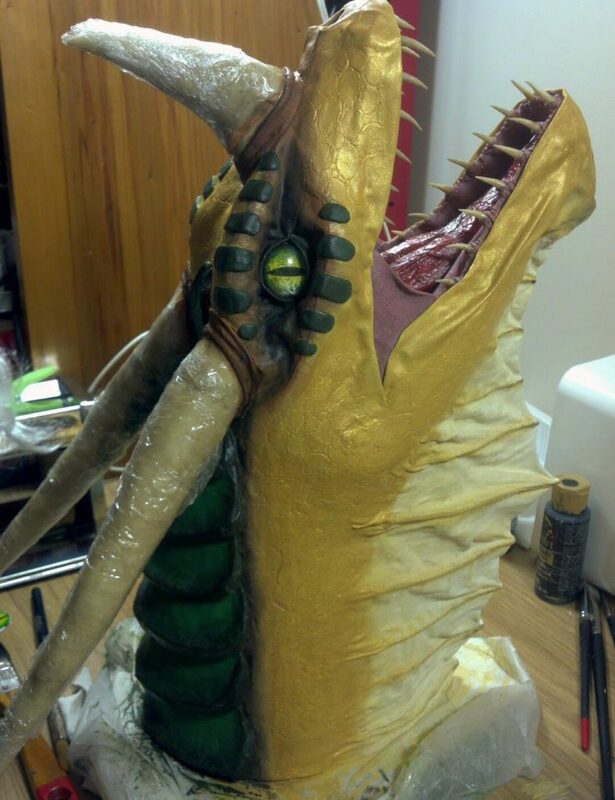 You see, normally I would add scales made out of cloth, but I had a feeling that wouldn’t work on her. I tried, and I was absolutely right. It looked dreadful (I’ll attach a picture down below). It looked as if her surface was split into separate parts, they didn’t blend into the design at all. So I removed them and started experimenting with textured fabric, textured papers and clays. After a while, I came to the conclusion that clay was the best option. 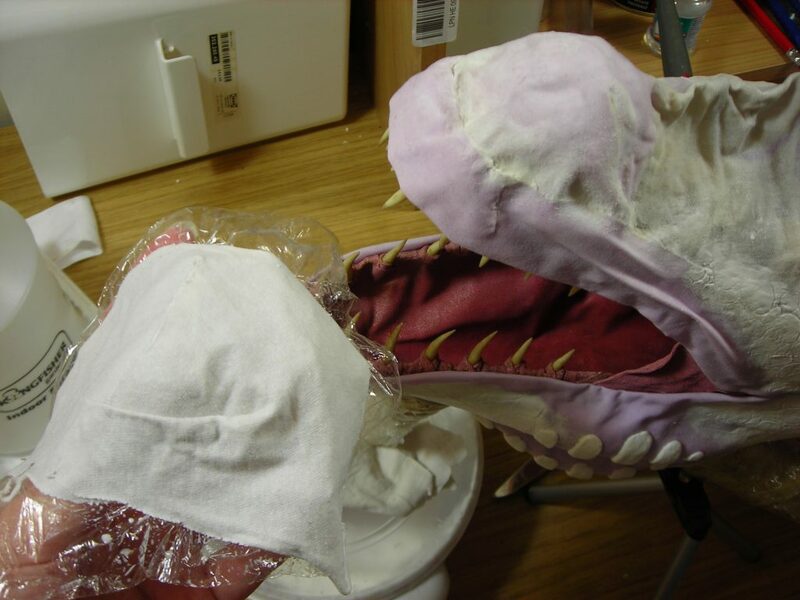 However, traditional or normal polymer clay wouldn’t work, since one does not simply stick a half-built dragon head in the oven. So I turned to air-dry clay. The problems I had to face with this type of clay were that firstly: it becomes brittle once dry, and secondly: it shrinks. A LOT. So I needed something that was strong enough so it wouldn’t detach, crack or crumble if dropped or struck hard while being transported, and also something that didn’t shrink a lot. 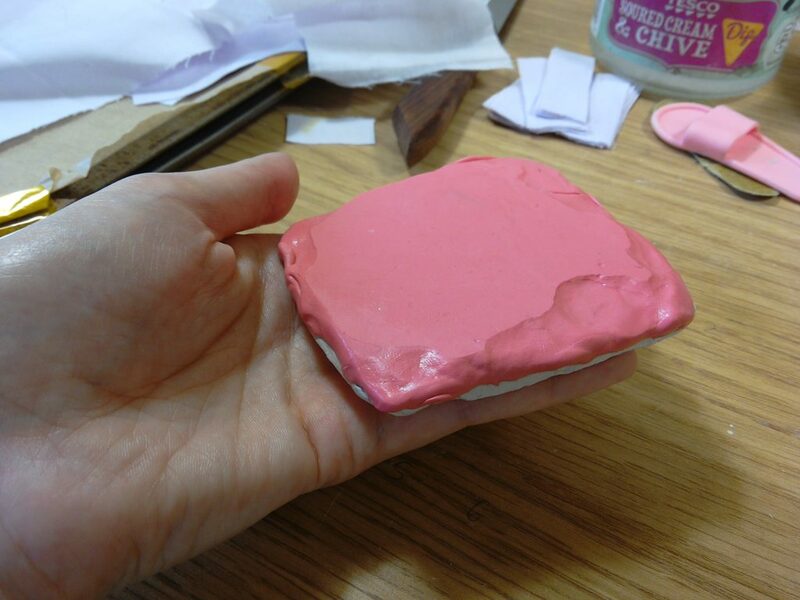 I tested quite a few different clays and mixes that I bought from here and there, and they all shrunk so much, they warped and deformed their cloth/paper base support. But in the end I prevailed! I found “the right stuff”. 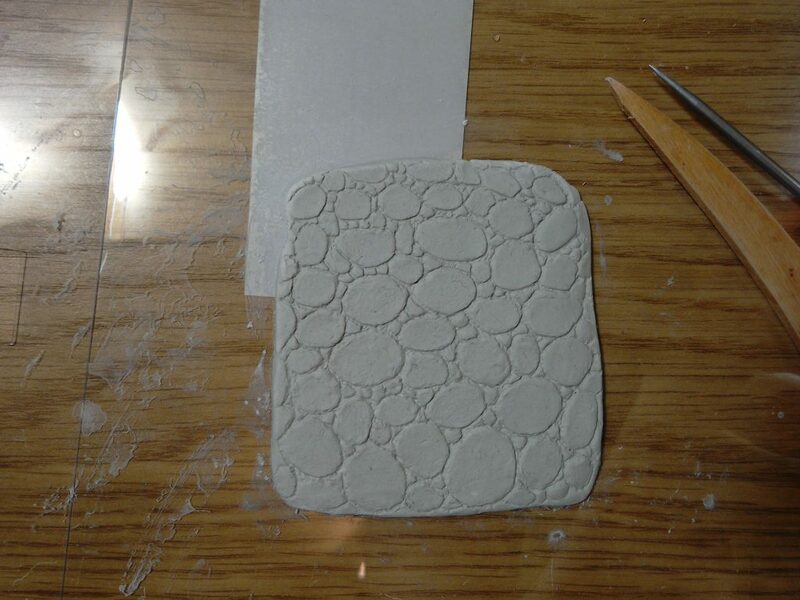 It’s a mix of two different air-dry clays: Cloud Clay by Amaco and Fimo Air Light by Staedtler. (I’m not sponsored or anything, just saying). These two clays are very unique (especially Cloud Clay) and I’ll explain why. Cloud Clay is described by the manufacturer as “Light as air, non-toxic Cloud Clay comes in 10 colors and is perfect for ages 3 and up. This soft, puffy, and pliable modeling material is fun to squeeze and model. Formulated to have more “stretch” than other brands, the fibers in this clay will not break apart as easily when pulled”. All of this is true, but there’s more to it. It’s nothing like any clay I’ve seen before. 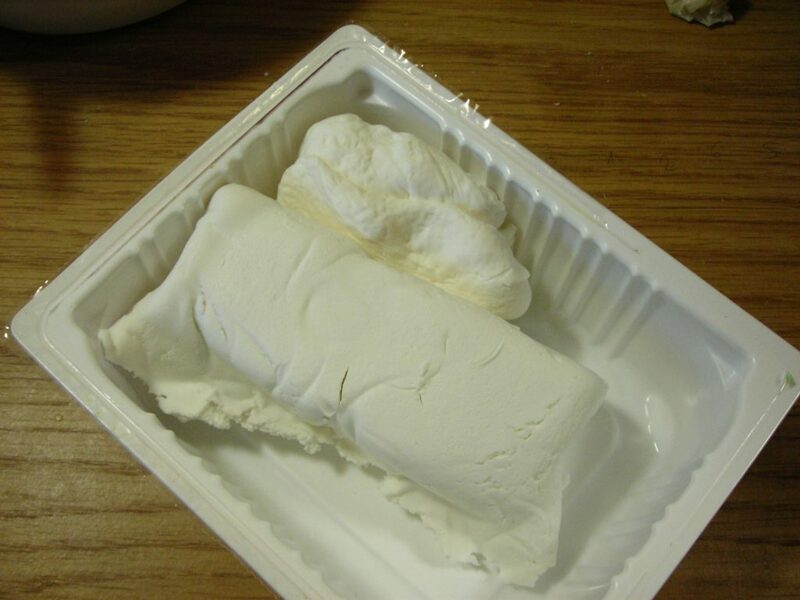 Imagine a big chunk of marshmallow that could stretch like chewing gum, and there you have it, that’s what it’s like. It’s extremely soft, stretchy and bouncy. But the best thing about it is that it doesn’t really shrink that much. It stays pretty much the same size it was when wet, and not only that… it also doesn’t harden like solid rock. Instead, it retains some of the softness and flexibility, so this makes it VERY resistant to shock damage. Just what I was looking for! The only bad thing is that it’s really bad for details. When you push it down, it bounces back up a little (kind of like a marshmallow), but that’s when the other clay comes in! 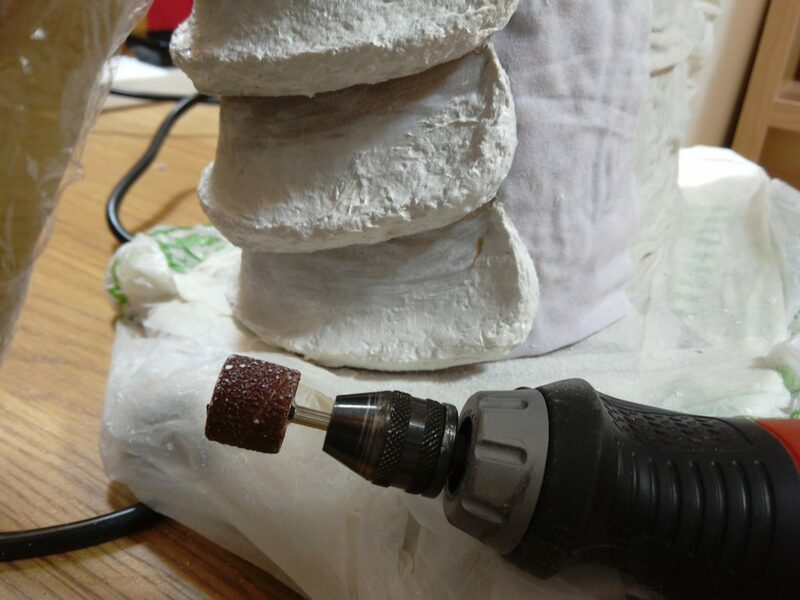 Regarding Fimo Air Light, well… this one is more like traditional air-dry clays. The texture feels a bit different, crumbly and a bit irregular (I found that it needs a lot of kneading to be smooth). But it’s very light and it’s designed so the shrinkage is minimised. It’s supposed to shrink only 7%, compared to the normal 15% or so. As with any other regular air-dry clay, you need to keep it moist while you work or it will begin to harden up irreversibly. Here you can see both clays before I mixed them. 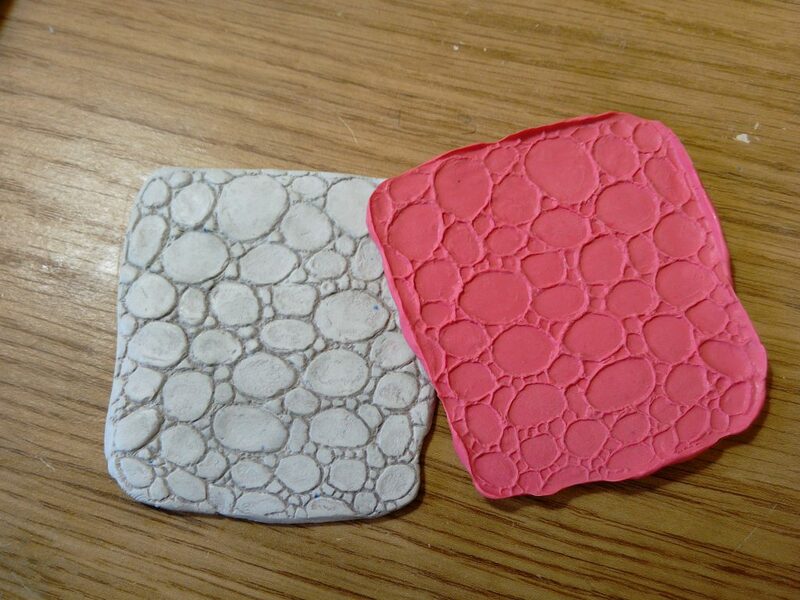 It’s two parts Fimo, one part Cloud Clay (ish). Also, here’s the picture I promised of Anachromie with scales. See how they don’t work? 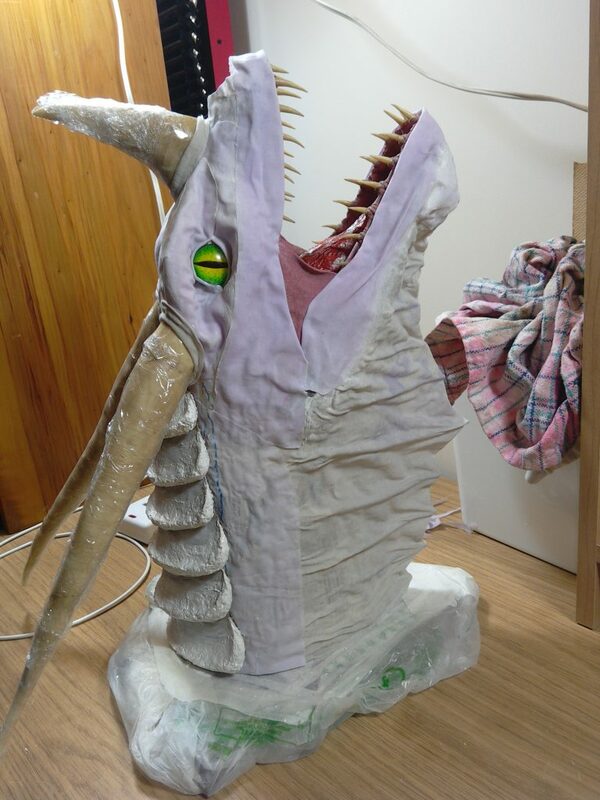 Normally, because you can divide dragon parts into head and neck (separated by the ear membranes), and then the plates on the lower neck, everything falls into place. But Anachromie is different. She doesn’t have neither neck plates nor ears, so it’s all part of one big thing, and it doesn’t look right if only a part of it has scales. But don’t worry, this it going to work! I will soon update you on the progress. This morning the postman dropped off a rather large junkmail flyer. When I picked it up, that feeling of thin, rough paper inspired me to start working on the back plates. 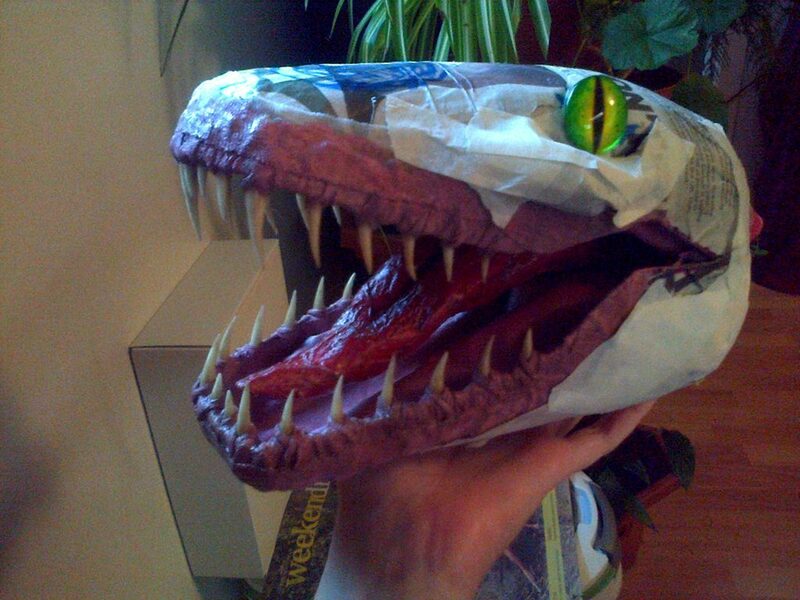 As I said I would do last time, I covered all of them with paper mache. Notice in the pictures how I added the top plate that goes over the forehead. I made that with air-dry clay. 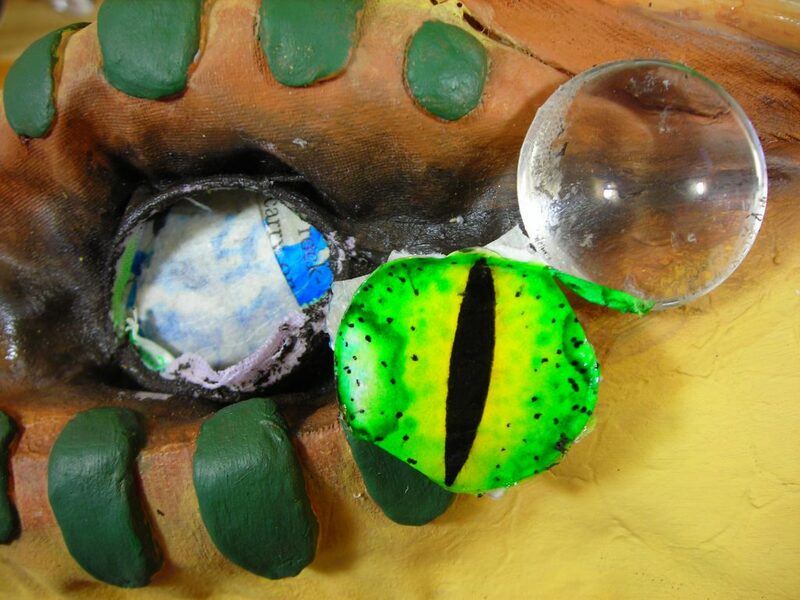 The surface smooth as it could be, but I still gave it a layer of paper mache to match all of the surfaces. Once dry, I confirmed it was just what it needed! Now, regarding the face… Gosh. The face. It is fixed now. Not that I’m 100% happy with it, but I think it’s decent enough. 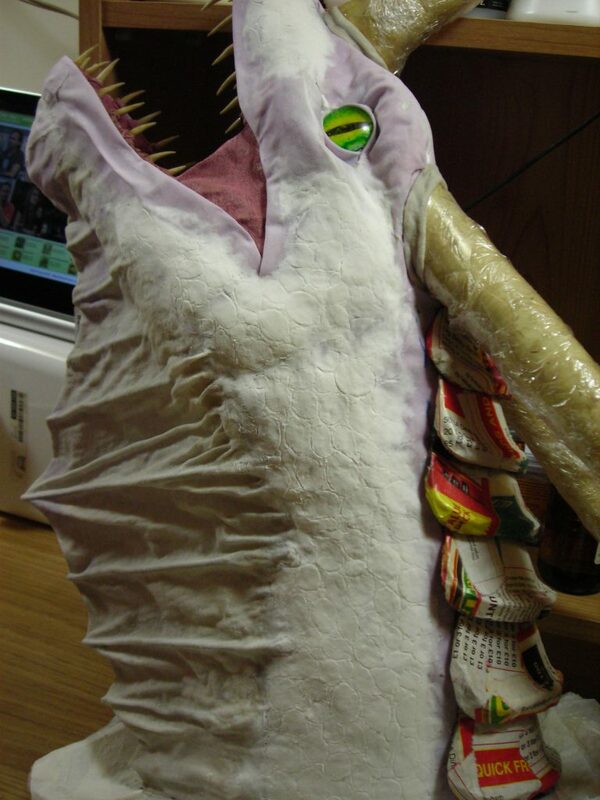 I’m sorry I didn’t take pictures of the process to modify the shape, but I’ll explain. Basically, what I did was dampen the whole mouth over night by covering it with wet towels. 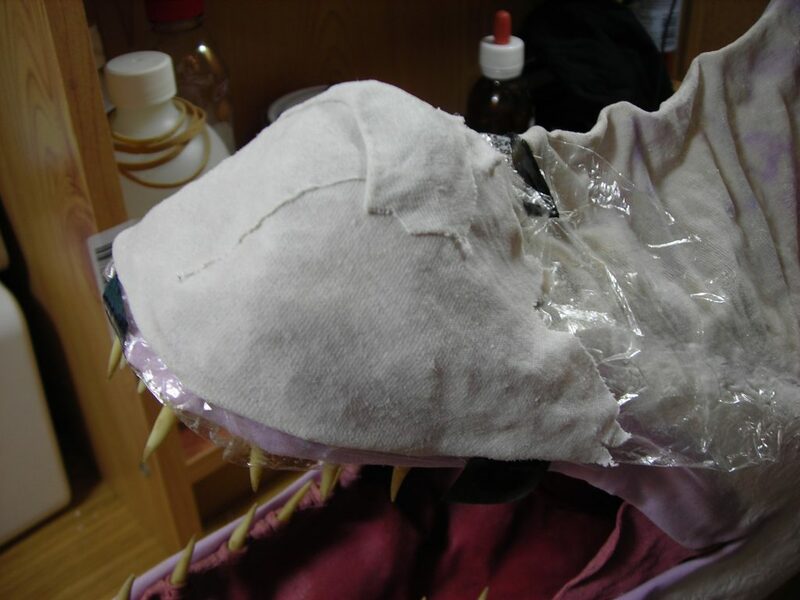 In the morning, all of the materials were soft and moldable, so I stretched the mouth open by putting a long wooden stick inside, and then warped the shape of both jaws into a more natural way by putting strong rubber bands in different places of the mouth. I cut a few pieces of 3mm steel wire and shaped them to size so it wouldn’t deform in places I didn’t want it to. Think of those as braces. Then of course, I let it dry up, and to my surprise, it looked good! I wasn’t sure it would work at all, but it did. I don’t have exact pictures to show you a before/after, but you have to trust me, it was awful before. Something I realised once it was dry, was that the lips were too full. I filled them up with bits of cloth (as I normally do) to make them look a bit fuller, but in this case it didn’t look right… it just didn’t. 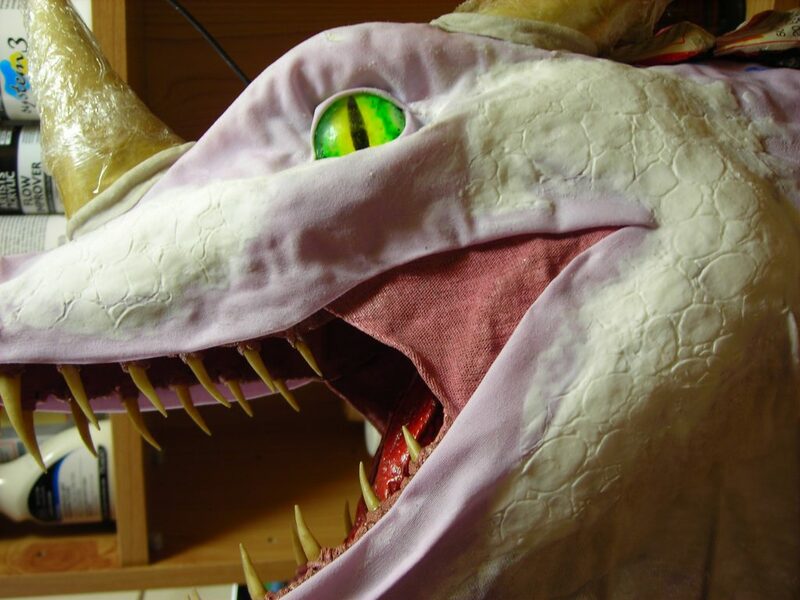 This dragon is smooth and sleek, and it needed flatter lips. So well, instead of dampen up the nose to fix it, I made all of the face wet again and ripped off both the nose and the lips. I cut, refolded and reshaped everything until it looked alright and then I let it air. Check the results below… what do you think? Experiments. This particular dragon is a big experiment on its own, which is very exciting actually. 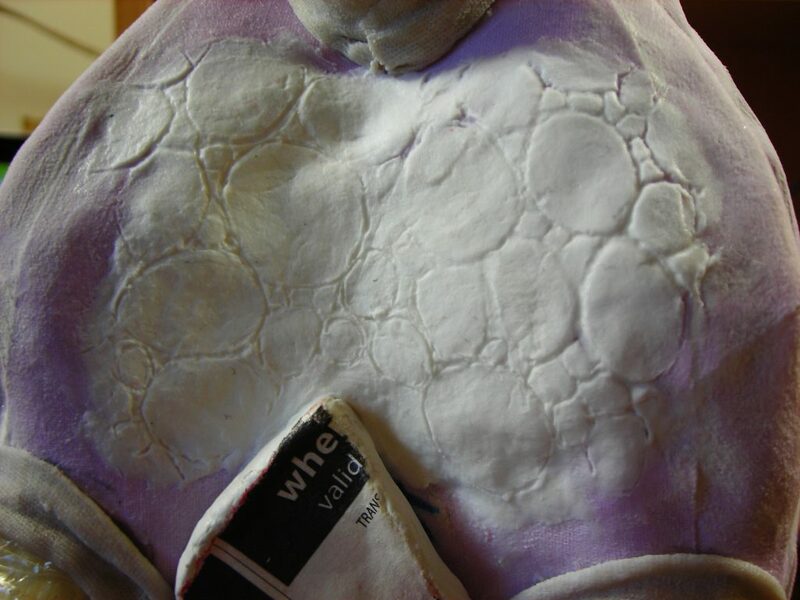 As you can see, I added the skin with cloth mache (cloth dipped in PVA glue). 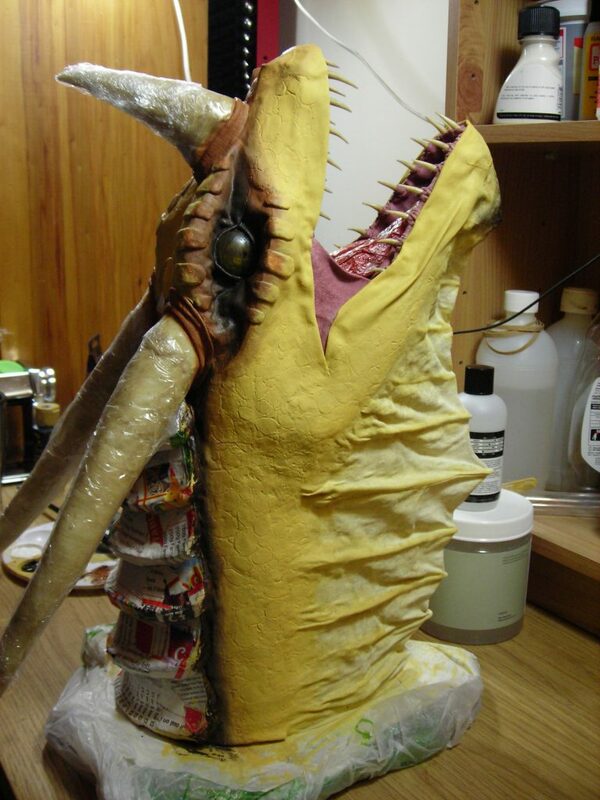 I must say though, if the face was looking derpy before adding the skin, now it’s like twice as bad. The nose is hideous, but the lips are twice as bad… I definitely need to do something about them. Anyway, I decided to begin working on the back plates. First, I drew where they would go with a marker. Then I just cut exactly six pieces of cardboard in slightly incremental length and width, and bent them until I was satisfied with them. 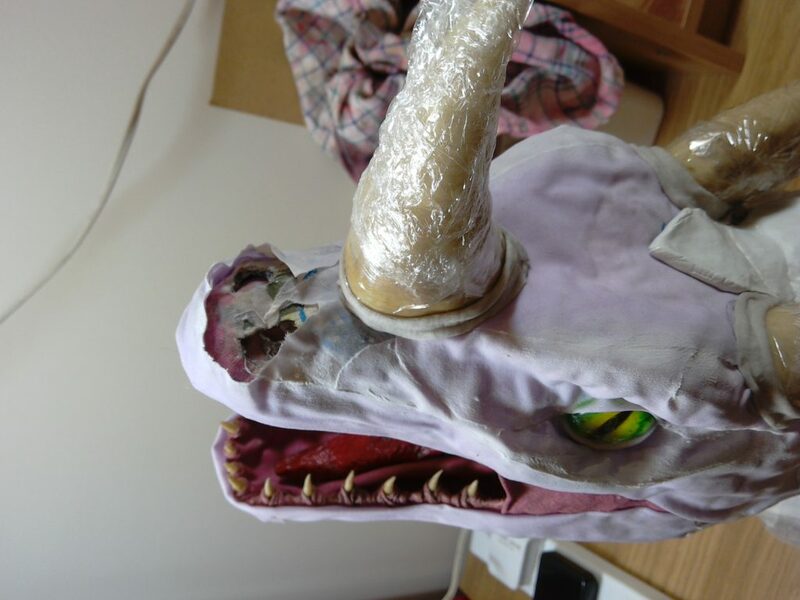 I proceeded to use hot glue to secure them to the dragon, and made the top piece that goes on the forehead with air-dry clay. 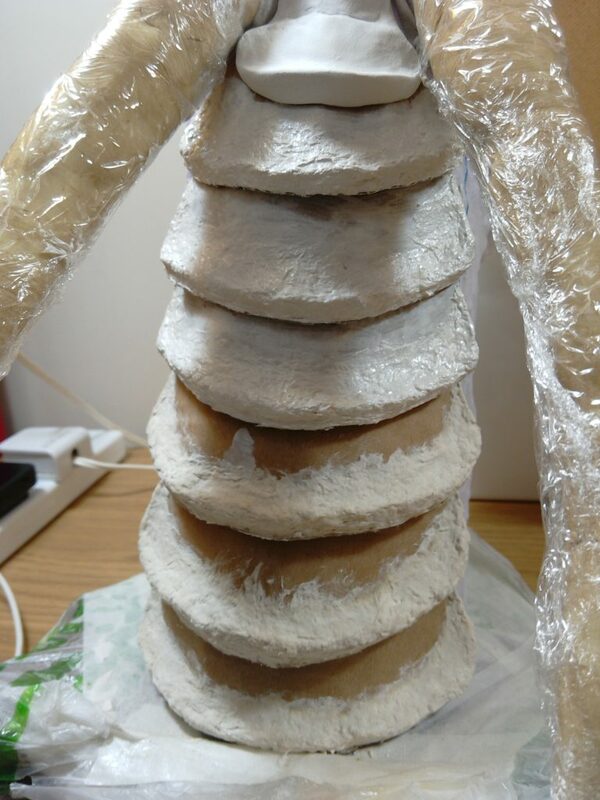 While the clay dried up, I made an experimental mix of paper clay consisting of toilet tissue, water, all purpose ready-mix filler, simple flour and PVA glue. With this paste, I added some volume to the ends of each back plate and let it dry. 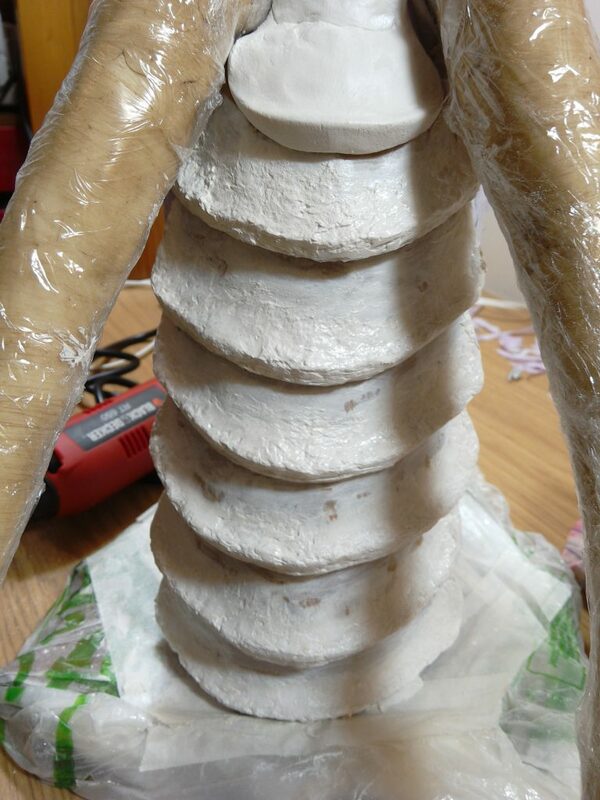 I’ll tell you something… that paper clay dries hard. VERY hard. And unfortunately, very irregular as well. Even though I tried to even the surface as much as possible, in the end I decided to give it a few layers of top quality shellac-based primer/sealer to ease those imperfections. It helped, but not a lot. So I decided to pull out the Dremel (rotary tool) and gave it a gooooooood smoothing. In the end it looked much better, but not perfect. 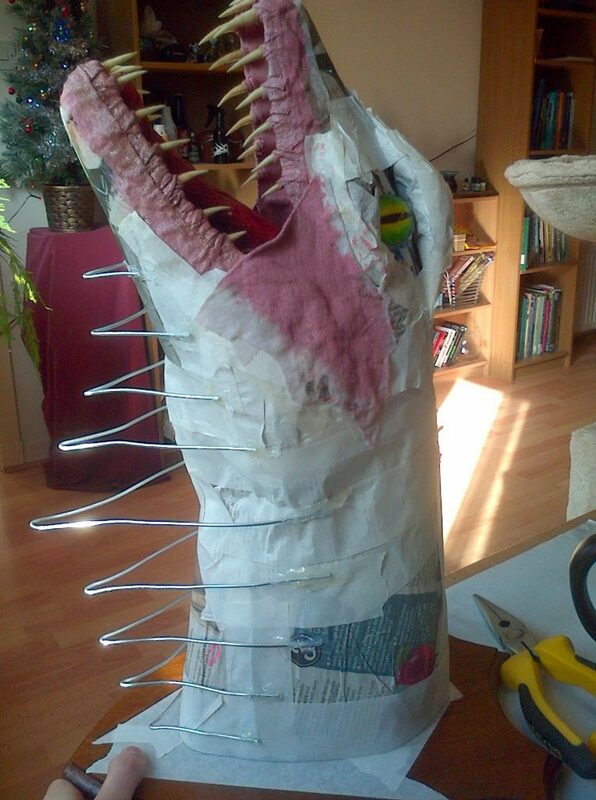 I think I’ll cover everything with paper mache. By the way if you noticed how Anachromie is now missing her nose and her mouth looks different… don’t worry, I’ll explain everything in the next post! So I put the mouth together, attached cheekbones, made the lower jaw’s cheeks extra puffy, glued the eyes in and topped them with eyebrows… and STILL. Still, she’s looking square, boring and derpy. Especially derpy. 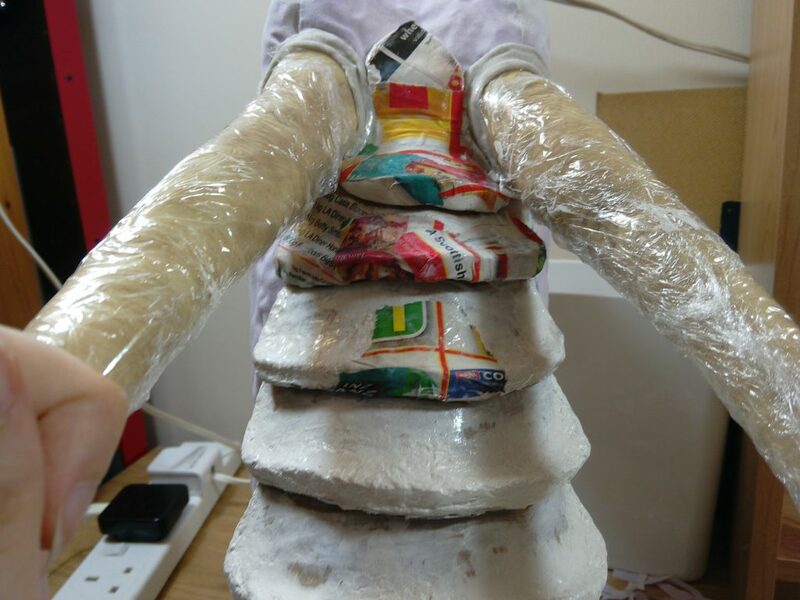 Anyway… I prepared the shield, drilled it and secured the neck to it, then proceeded to attach the head to it with wire, hot glue and lots of tape. 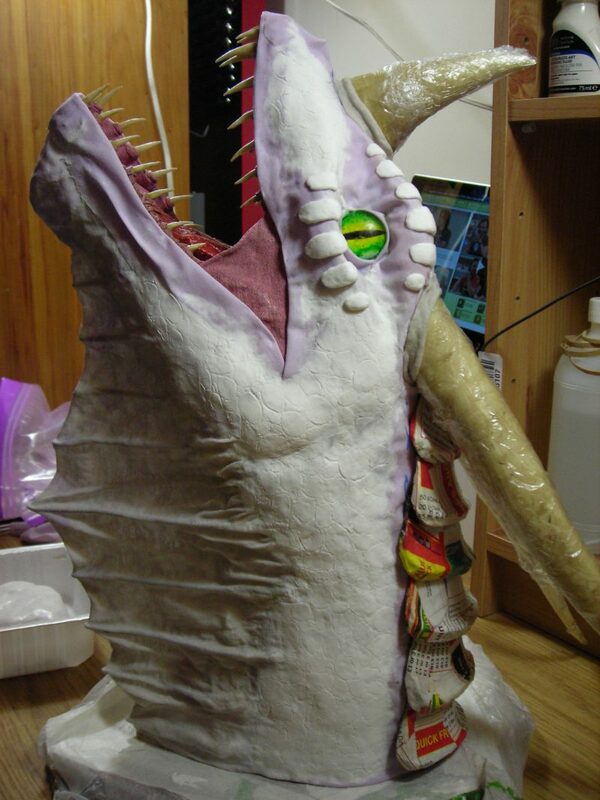 I also added the chewing side muscles and made the throat look more natural. Now, Anachromie has very large and long jowls hanging all the way to the base of the neck. To do this, I just cut a bunch of pieces of steel wire, shaped them and glued them in a way that made sense. It’s not 100% faithful to the original model, but I need to make it look nice enough and the base needs to fit within the oak shield, so there you go. 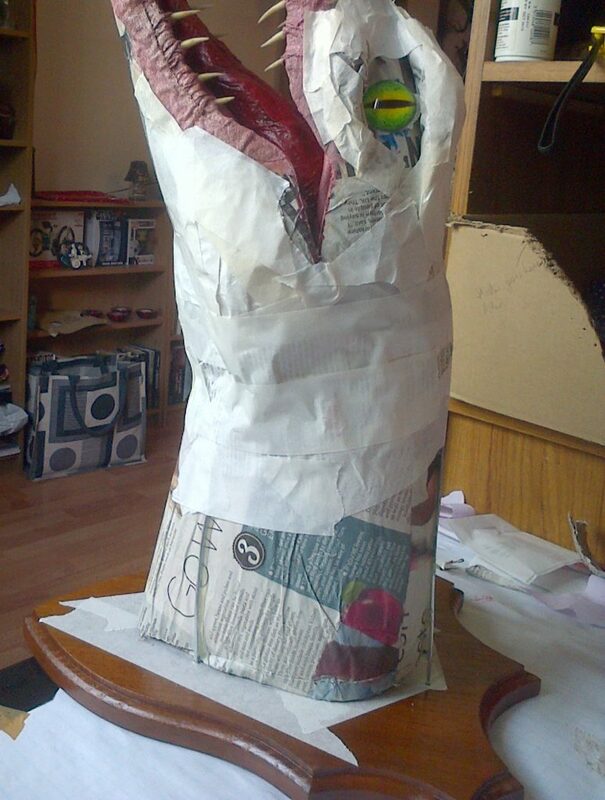 I am curious to see how it will look when I cover it all with cloth! Are you too? PD: Even after all of that, it’s still looking derpy. Gah!